This is a light teal not blue but gorgeous. It can work as a doormat in areas with little traffic like going into a bedroom. Love it. 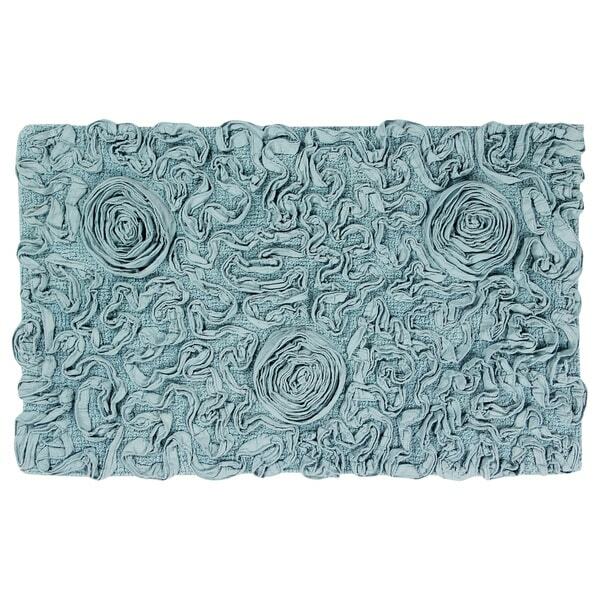 This stunning bathmat features subtle rose designs on bold solid color. Crafted of 100-percent cotton and backed by a no-slip latex backing, this mat offers safety and style. This is a beautiful bath rug. I wanted a rug for the bathroom that had non-skid backing and when doing my research by reading the description this rug claimed to have it, however upon arrival I see that it does not. I will keep the rug but other buyers beware of this error if you have a specific need for non-skid backed rugs. I love this bath mat (mine is a lovely red). It was kinda splurge-y, but I am upgrading my bath linens and this was easily the prettiest bath mat I had ever seen. The mat is cotton fabric with non-skid backing. It feels deep and soft underfoot. The flowers will probably be a little delicate in the wash; I plan to roll it and wash it on gentle cycle with my (also pretty) new towels. Sent the wrong color! Overstock always gets it wrong. BUT it is far better in person. Poor rating because customer service and accuracy make or breaks a business. Well ,​update I moved and all my guest want one as it actually matches the bathroom I put it in. Happy I decided to keep it was a gift that got regifted back​ tome. The irony. I absolutely love the shabby chic vibe of this rug. It’s very well made and looks great in our farmhouse style bathroom. We actually bought the butter color and it has a mustard tone which is just what I wanted. Definitely recommend this product! The rug has pretty detail and the color is a lovely yellow. I took away a star because a bit more non-skid backing would increase safety by the shower or tub. I am at risk for falls and a bit more backing would help me feel safer. the rug is pretty. I got it in deep red. It is cotton and I haven't washed it yet so I don't know if it will fade or shrink. I wont leave it on the floor because it is the size of a bath mat and seems too delicate for normal wear. I hang it over the tub and limit its use to that. It is a way to put color and style into the bathroom. The downside is that if it fades it is overpriced. If it doesn't fade it is worth being priced higher than an average rug of this kind of material. I have order 3 of these bath mats. They are beautiful, but the red on (I have sage, ivory and red.) did not wash well. I followed the instructions. They may be machine washed with not bleach and mild soap and air dried. This is not work well for the red colored bath rug. I am very disappointed and if I had the take still on and the original everything I would have returned it. I will never use it again and it is not a good choice. I absolutely love this rug! The only thing that you need to be careful with is washing it. Make sure you wash it on gentle cycle. It is very delicate. I loved this bath mat when I saw it, but wasn't sure how sturdy it would be. I was pleasantly surprised to find it very well made. Love the color, which matches our bathroom walls, and it's very soft and cushiony. Would buy it again in a heartbeat! Very nice bathroom rug. If your looking for something really sweet, or very different ~ try these! So cool on many levels. I keep coming back for more in different colors. Very well made and adds a lot to the bath! 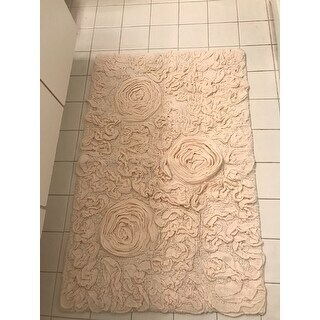 Unfortunately, I had to return this beautiful bath rug. My door wouldn't close. It was beautifully made and sure would have liked to keep it. I have this in pink. Love it. Very pretty. Just okay, color (natural) looked a little dingy. I don't see this rug holding up to foot traffic and frequent washing. This is a soft product. The size is perfect in any bathroom. The color was so close to the picture as well! I’ve had this in the guest bathroom for a year and it’s still just as gorgeous as the day I got it. I love the texture, and the yellow color is the perfect soft buttery yellow. Great color, not super plush so it fits under the door well. I’m pleased with this purchase. The color is rich and the size is perfect. The rug added such warmth to my guest bathroom. A couple of my girlfriends were at my home when it was delivered. They complimented it highly, heck one of them wanted to buy the set from me. 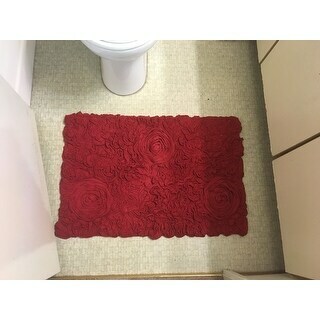 I got the heart shaped matching rug for the toilet area of the guest bathroom. The perfect size and color. Easily goes into washer and dries quickly on its own. Perfect addition to my newly renovated bathroom! "Is it non skid or no? The reviews are v mixed. Thank you!" This features spray latex backing. "Do you still have the 21x34yellow rug"
The yellow is currently out of stock. If we receive an estimated restocking date we will update you. "What is the size of this rug? In the title, the size is 22x18. However, in the product specs, it says the rug is 21x34. Which is it?" It is closer to the 22x18. I'm sure the design of the rug make it come out different measurements. It's adorable....I bought the yellow and it's perfect! I love yellow rose anything! The rug is well made and is a classy addition to a bathroom or beside a bed. "Hello. I am wondering if the butter looks like a gold or if it is more yellow. Thanks. " "Will you be getting this bath rug in blue back on stock?" The blue option is currently in stock. "I am looking for a ivory color to match the shower curtain I have . The natural looked like the color I needed until I read the review that it is more grey. What is the true color of the beige one." it is not grey. it is ivory. "Does this rug have a non-skid backing? The description says it does, but one reviewer said it did not." it has spray latex backing , not rubber backing.